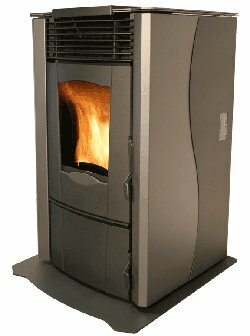 The Enviro Omega pellet stove has a high heat output, (60,000btu. ), a very large heat exchanger and a 200cfm. convection fan. It's designed to heat large areas of up to 2,500 square feet. Apart from wood pellets, it will burn fuel with a high ash content such as corn and pellets made from wheat, rye, high bark pellets, paper and grass pellets. This could be of great benefit in times of wood pellet shortage and the high pellet prices that shortages cause. The burn pot has an ash scavenger which dumps excess ash into the large ash pan. A double air intake for the burn pot ensures even combustion. This stove comes with a bolt on hearth pad as standard. Heating Area 2500 sq. ft.
Fuel Type Standard or premium wood pellets: also corn and pellets made from wheat, rye, high bark pellets, paper and grass pellets. Convection Blower Capacity 200 cfm. Rear Vent Height 14.2 in. Colours Matte black with charcoal side panels, (side panels can be painted with high temperature paint). It is possible to paint the side panels of the Enviro Omega with high temperature paint in a colour that you like. Don't know why it's not possible to order the stove from Enviro with the panels pre-painted. Inspect burn pot and liner. Check daily, clean out air holes weekly. Clean agitator. Clean the back of the stove inside. Check and clean the exhaust flue every year or after burning two tons of pellets. Vacuum dust from the blowers. If you would like to leave a review of the Enviro Omega pellet and multi fuel stove, please use the form on the contact page.